Davido and Wizkid might have settled their beef behind closed doors or apparently don’t have any beef at the moment given their “beef inactivity” for a while but what we do know is the fight started a long time ago. It started when both were in the early years of their careers. Wizkid had just released his debut album and won the next rated award ahead of arch-rivals, Olamide and Ice Prince. He was just 19 years old then. The hottest young guy running the country that moment. He was a ladies’ favourite to, they could die just to have a one-night stand with him. Everyone wanted to collaborate with him from D’Prince to Lynxx to Durella, everyone needed him to bless their track with that sonorous voice. Also, the show organizers, there’s no party if Wiz is not there. He was always at every show. Then came Davido. Nobody knew Davido then except his friends and family and also Naeto C, his nephew. He released Dami Duro. To be truthful, that song received a lot of backlash and criticisms from internet users. It was just too poor in content. the lyrics was just repeating itself. I’m sure it was B’Red that wrote the song. But guess what, it was heavily promoted. Every music blog wrote great reviews about it. Seems Davido paid them. It was not correlating, the same song we all listened to? Wizkid was obviously seething. Davido was everywhere, every club, Radio and TV station was playing the song. The song topped charts due to its heavy promotion. Wizkid must have been saying “Who is this one again, this one has come to spoil market.” However, Davido and Wizkid became friends as soon as possible. Wizkid appeared in the Dami Duro video, just to calm fears he was his arch-rival. Davido also appeared in the Pakurumo video. All seemed cool. Davido won Next-Rated while Wizkid won the album of the year. The two short guys were running the town but there was no Runtown then. Davido was looking up to Wizkid, wanted to attain his level of stardom, Wizkid had won his first BET in 2012 and already started to become friends with the American superstars. Davido was obviously jealous of this. 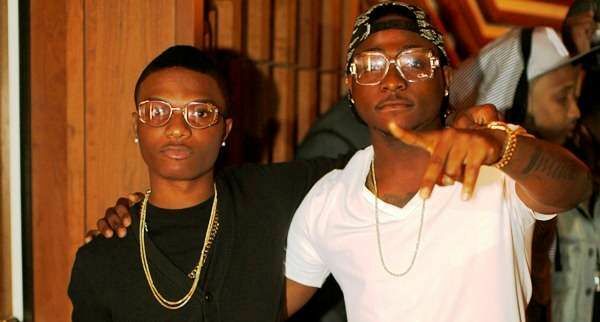 Then trouble started in 2012 when Davido was allegedly reported to have walked out of the 2012 NEA Awards when he saw that wizkid was performing. US based comedian Foxy P gave a vivid description of how it happened; “Davido and his HKN crew including Sina Rambo and B-Red came very late to the event and instead of waiting for a lull they just bounded all the way down the steps to the front row where EME stars Banky W, Skales, etc were sitting. They were relatively calm till towards the EME performance that started with XO Senevoe, Rotimi, Skales then Banky and Wizkid. At the time Wizkid came up Davido just got up with his whole crew and they all walked out. It wasn’t like they were rushing anywhere because everyone was eventually going to the after party so there was no hurry. I came out after he did and noticed that the entire HKN crew were just standing outside the auditorium doing nothing. It was clear to see they came out because they couldn’t stand to watch Wizkid perform.” That was the first report of a beef between the two. However, the two quashed any report of the beef with a photo at the club. All nerves were calmed. However, the beef went official in July 2014 when after arriving in New York for separate concerts and when Wizkid landed, he wrote on social media, “Just landed in NYC! Let’s turn up! we do proper shows and proper venues”, and then as if on cue, Davido responded saying, “fake as* ni**a!! That’s y he got none of his Day 1 ni**as around him! Pu**y!”. The posts by both artistes got everyone excited as it finally seemed like a legitimate beef was brewing between the pair. Well, that’s how the beef started between these two extraordinary acts, however they made up after that beef, performed together but that’s not the case recently as they still take shots at each other often on social media. So this is a poser for you all, why do you think these guys beef each other? For money? To get more attention? To edge out one another? An who is responsible for the beef between these two guys, after all there were friends from the start? Kindly have your say in the comment box.